I'm going to be 40 years old soon. For my birthday I asked for a pull up bar. A long time ago I could whip out pull ups. No longer can I do that and I want to be able to do one for my fortieth! 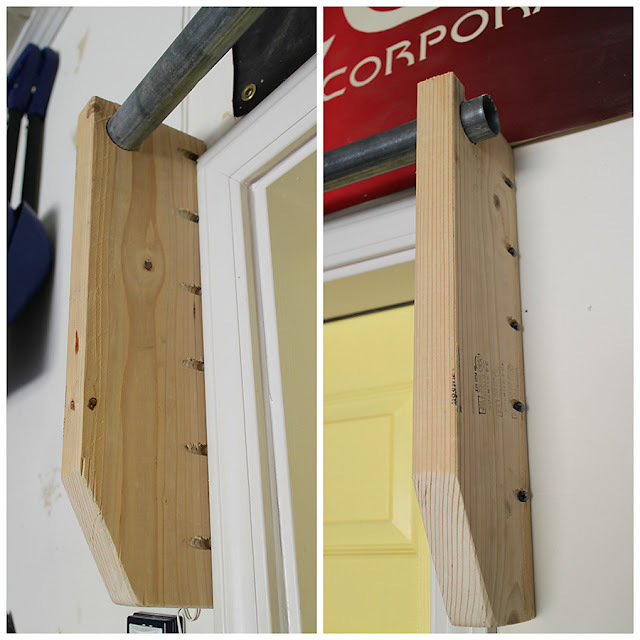 My husband built me a DIY pull bar because they were super expensive to order and he didn't like the reviews or looks of some of the manufactured ones. I don't have any photos of the construction process because I wasn't involved. (It was a birthday gift!) But Biker Boy built it quickly and said it was easy. He framed it around our garage door that leads into the house. It uses two 2x6 boards. He angled the bottom and rounded the cuts, but you could just use straight boards. 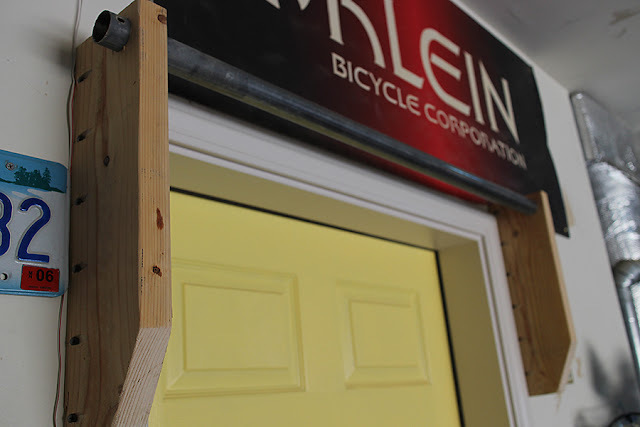 The boards are drilled into the wall/door studs. Biker Boy used a pocket hole jig to make holes to put the screws in. He put 5-6 in each side of each board, so 10-12 screws in each board. Those boards aren't going anywhere with that many screws into a stud. Biker Boy originally was going to use a wooden closet rod pole we had laying around, but we had some metal trampoline poles and he used one of those. 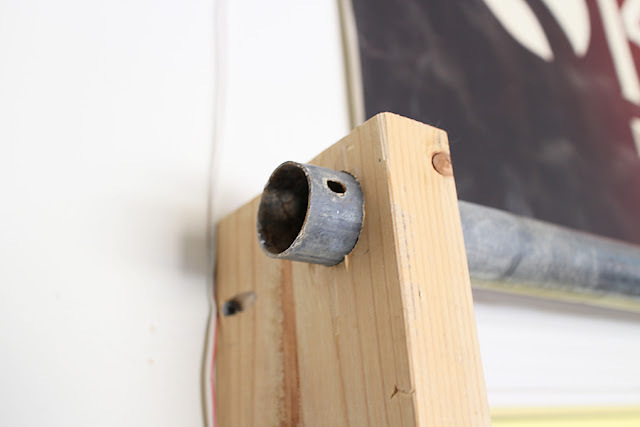 Bike Boy used a spade bit to drill holes into the side boards and inserted the poles through the holes. The poles are wedged in those holes, so we left them. You could use screws through the wood and into the pole to keep the pole steady and in place. I try to do one to two when I leave the house. The kids are really great at reminding me. 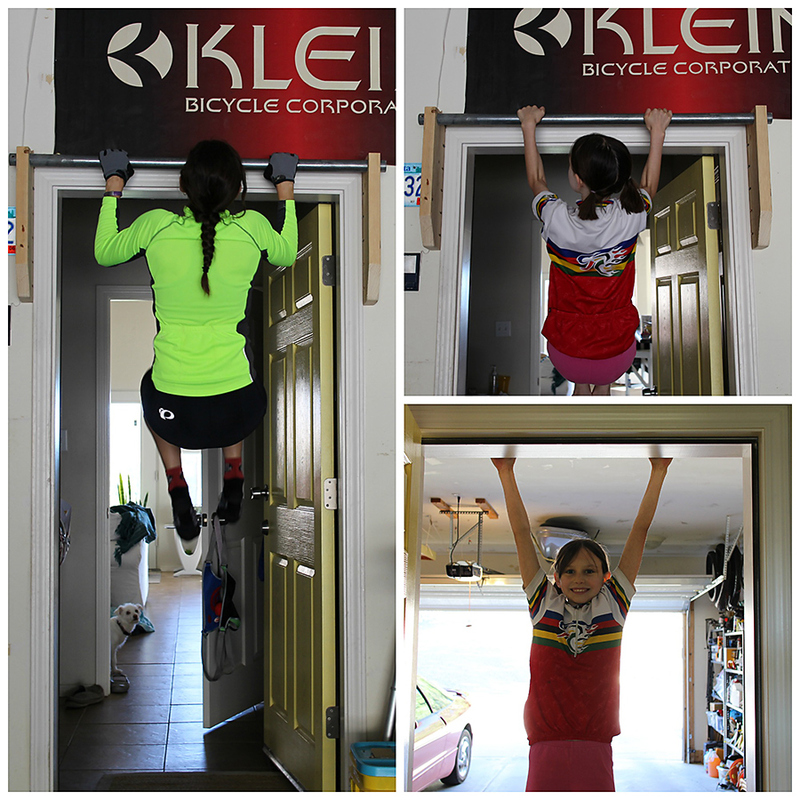 They also like to hang from the bar and attempt their own pull ups. Here's my girl and I each attempting one after we took a tandem ride together. See the dog peering out the door? It's not the fanciest thing ever, but it's just in our garage. It works, it was fast to make, and it was cheap! A perfect birthday gift! Do you attempt pull ups?